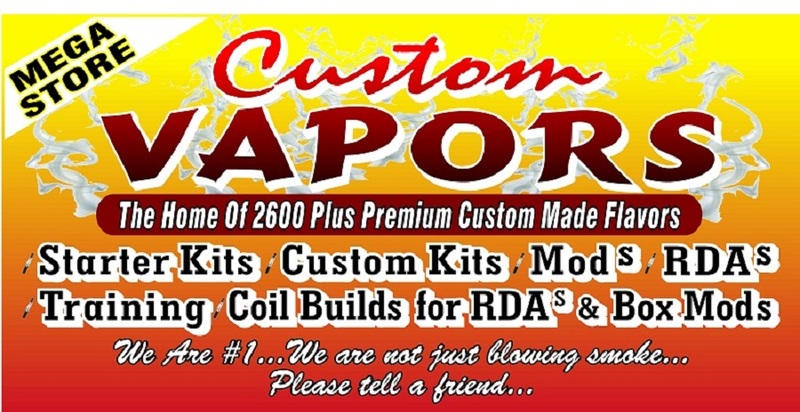 Custom Vapors Inc premium vapors (e-juices) are hand crafted right here in the United States. We use the finest quality ingredients. All of our vapor liquid is diacetyl free and have a great amount of flavor. Since our vapor (e-juice) is mixed fresh, it is best to steep it before use. 99% of the time your e-juice will ship within 24 hours. Not all vapor (e-cig juice) is safe to use in plastic tanks. Please refrain from using the following flavored vapors in plastic tanks: Licorice, Cinnamon, Citrus Flavors, Mtn. Dew, Sweet Tarts, Green Apple, Ginger, Amaretto, Marashino, Cherry, Root Beer, Lavender, Pink Lemonade, Ripe Banana and Cola!